Chapter VIII PENTECOST from THE MIND OF THE MAKER By Dorothy L. Sayers Metheun & Co. Ltd. London, 1941. WHEN THE writer’s Idea is revealed or incarnate by his Energy, then, and only then, can his Power work on the world. More briefly and obviously, a book has no influence till somebody can read it. Before the Energy was revealed or incarnate it was, as we have seen, already present in Power within the creator’s mind, but now that Power is released for communication to other men, and returns from their minds to his with a new response. It dwells in them and works upon them with creative energy, producing in them fresh manifestations of Power. This is the Power of the Word, and it is dangerous. Every word—even every idle word—will be accounted for at the day of judgment, because the word itself has power to bring to judgment. It is of the nature of the word to reveal itself and to incarnate itself—to assume material form. Its judgment is therefore an intellectual, but also a material judgment. The habit, very prevalent to-day, of dismissing words as “just words” takes no account of their power. But once the Idea has entered into other minds, it will tend to reincarnate itself there with ever-increasing Energy and ever-increasing Power. It may for some time only incarnate itself in more words, more books, more speeches; but the day comes when it incarnates itself in actions, and this is its day of judgment. At the time when these words are being written, we are witnessing a fearful judgment of blood, resulting from the incarnation in deeds of an Idea to which, when it was content with a verbal revelation, we paid singularly little heed. Which Ideas are (morally) Good and which are anti-Good it is not the purpose of this book to discuss; what is now abundantly manifest is the Power. Any Idea whose Energy manifests itself in a Pentecost of Power is good from its own point of view. It shows itself to be a true act of creation, although, if it is an evil Idea, it will create to a large extent by active negation—that is to say, by destruction. The fact, however, that “all activity is of God” means that no creative Idea can be wholly destructive: some creation will be produced together with the destruction; and it is the work of the creative mind to see that the destruction is redeemed by its creative elements. It is the business of education to wait upon Pentecost. Unhappily, there is something about educational syllabuses, and especially about examination papers, which seems to be rather out of harmony with Pentecostal manifestations. The Energy of Ideas does not seem to descend into the receptive mind with quite that rush of cloven fire which we ought to expect. Possibly there is something lacking in our Idea of education; possibly something inhibiting has happened to the Energy. But Pentecost will happen, whether within or without official education. From some quarter or other, the Power will descend, to flame or to smoulder until it is ready to issue in a new revelation. We need not suppose that, because the mind of the reader is inert to Plato, it will therefore be inert to Nietzsche or Karl Marx; failing those, it may respond to Wilhelmina Stitch or to Hollywood. No incarnate Idea is altogether devoid of Power; if the Idea is feeble, the Energy dispersed, and the Power dim, the indwelling spirit will be dim, dispersed and feeble—but such as it is, so its response will be and such will be its manifestation in the world. It is through the Power that we get a reflection in the mind of the world of the original Trinity in the mind of the writer. For the reader, that is, the book itself is presented as a threefold being. First: the Book as Thought—the Idea of the book existing in the writer’s mind. Of this, the reader can be aware only by faith. He knows that it does exist, but it is unknowable to him except in its manifestations. He can, of course, suppose if he likes that the book corresponds to nothing at all in the writer’s mind; he can, if he likes, think that it got into its visible form by accident and that there is not and never was any such person as the writer. He is perfectly free to think these things, though in practice he seldom avails himself of this freedom. Where a book is concerned, the average man is a confirmed theist. There was, certainly, a little time ago, a faint tendency to polytheism among the learned. In particular cases, that is, where there was no exterior evidence about the writer, the theory was put forward that the Iliad, for example, and the Song of Roland were written by “the folk”; some extremists actually suggested that they “just happened”—though even such people were forced to allow the mediation of a little democracy of godlets to account for the material form in which these manifestations presented themselves. To-day, the polytheistic doctrine is rather at a discount; at any rate it is generally conceded that the Energy exhibited in written works must have emanated from some kind of Idea in a personal mind. Secondly: the Book as Written—the Energy or Word incarnate, the express image of the Idea. This is the book that stands upon our shelves, and everything within and about it: characters, episodes, the succession of words and phrases, style, grammar, paper and ink, and, of course, the story itself. The incarnation of the Energy stands wholly within the space-time frame: it is written by a material pen and printed by a material machine upon material paper; the words were produced as a succession of events succeeding one another in time. Any timelessness, illimitability or uncreatedness which may characterise the book belongs not here but in the mind; the body of the Energy is a created thing, strictly limited by time and space, and subject to any accident that may befall matter. If we do not like it, we are at liberty to burn it in the market-place, or subject it to any other indignity, such as neglecting it, denying it, spitting upon it, or writing hostile reviews about it. We must, however, be careful to see that nobody reads it before we take steps to eliminate it; otherwise, it may disconcert us by rising again-either as a new Idea in somebody’s mind, or even (if somebody has a good memory) in a resurrected body, substantially the same though made of new materials. In this respect, Herod showed himself much more competent and realistic than Pilate or Caiaphas. He grasped the principle that if you are to destroy the Word, you must do so before it has time to communicate itself. Crucifixion gets there too late. Thirdly: the Book as Read—the Power of its effect upon and in the responsive mind. This is a very difficult thing to examine and analyse, because our own perception of the thing is precisely what we are trying to perceive. We can, as it were, note various detached aspects of it; what we cannot pin down and look at is the movement of our own mind. In the same way, we cannot follow the movement of our own eyes in a mirror. We can, by turning our head, observe them in this position and in that position with respect to our body, but never in the act of moving themselves from one position to the other, and never in the act of gazing at anything but the mirror. Thus our idea of ourself is bound to be falsified, since what to others appears the most lively and mobile part of ourself, appears to us unnaturally fixed. The eye is the instrument by which we see everything, and for that reason it is the one thing we, cannot see with truth. 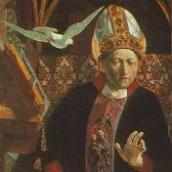 The same thing is true of our Power of response to a book, or to anything else; incidentally, this is why books about the Holy Ghost are apt to be curiously difficult and unsatisfactory—we cannot really look at the movement of the Spirit, just because It is the Power by which we do the looking. We may, however, note one or two things—fixed aspects of the Power. Like the Idea itself, it is immaterial and timeless. When we say we “know Hamlet”, we do not mean merely that we can memorise the whole succession of words and events in Hamlet. We mean that we have in our minds an awareness of Hamlet as a complete whole—“the end in the beginning”. We can prove this by observing how differently we feel when seeing a performance of Hamlet on the one hand and an entirely new play on the other. While watching the new play we are in contact with the Energy, which we experience as a sequence in time; we wonder “how it is going to work out”. If, during the interval, we are asked what we think of it, we can only give a very incomplete answer. Everything depends, we feel, on the last act. But when the final curtain has come down, we feel quite differently towards the play—we can think of it as a whole, and see how all the episodes are related to one another to produce something inside our mind which is more than the sum-total of the emotions we experienced while sitting in the stalls. It is in this timeless and complete form that it remains in our recollection: the Energy is now related to the Idea more or less as it was in the mind of the playwright: the Word has returned to the Father. When we see Hamlet (or any other play that we already “know”) we start already in this frame of mind. We are able, as the performance proceeds, to relate the part. to the whole and the time-sequence to eternity at every point. Just as the writer realised while writing that there was a complete Idea in his mind, because, step by step, he found himself relating the progress of his work to that Idea, so also we realise while watching the play that there is a “whole Hamlet” in our own minds to which we are busily referring every word and action as it passes before us. Our knowledge of how the whole thing “hangs together” gives us a deeper understanding and a better judgment of each part, because we can now refer it, not only to the past but also to the future; and, more than that, to a unity of the work which exists for us right outside the sequence of time. It is as though the writer’s. Idea had passed from eternity into time and then back into eternity again—still the same Idea, but charged with a different emphasis of Power derived from our own response. Not only that: if it is a play like Hamlet, which has already stimulated powerful responses in the minds of other men, our personal response will be related to a greater unity which includes all those other foci of Power. Every scholar and critic who has written about Hamlet, every great actor who has ever played the part, every painter or musician who has found a source of power in Hamlet, retransmits that power to the spectator, in accordance with the capacity for response that is in each. It is by this kind of process that words and phrases become charged with the Power acquired by passing through the minds of successive writers. Pure scientists (who find this particular kind of power embarrassing to them) are always struggling in vain to rid words of their power of association; and the ugly formations which they devise for this purpose have as their excuse their comparative freedom from the artist’s brand of creative power. Here is a trifling example. I was once taken to task by an arms expert for using the word “dynamite” as a symbol of explosive force. He contended, very justly, that dynamite was out, of date; we now knew a great many substances that exploded more readily and with more devastating effect. My defence was that the newer words, though associated with more material power, had fewer associations of literary power. “Dynamite” carries with it the accumulated power flowing from the Greek dynamis—such concepts, for example, as belong to the words dynamo, dynamic, dynasty, and so forth, and such literary associations as Hardy’s The Dynasts. Hardy's poem brings with it the thought of Napoleon’s explosion of power; “dynasty” taps the power of ancient Egypt as it is interpreted in our minds. The expression “tri-nitro-toluol” (which I might have chosen) is, at present at any rate, much less rich in verbal associative power; also, - its actual syllables unfortunately associate themselves with such jingling compounds as “tol-de-rol” and “tooralooral”—formations which, however powerful in their own sphere, contribute little to the energetic expression of “explosive force”. It is interesting to rake into one’s own mind and discover, if one pane what were the combined sources of power on which one, consciously or unconsciously, drew while endeavouring to express an’ idea in writing. Here, for instance, is a whole string of familiar passages which were obviously hovering about in my memory when I wrote a phrase in The Nine Tailors. When the morning stars sang together, and all the sons of God shouted for joy.—Book of Job. Above it stood the seraphims: each one had six wings; with twain he covered his face, and with twain he covered his feet, and with twain he did fly.—Book of the Prophet Isaiah. He rode upon the cherubims and did fly; He came flying upon the wings of the wind.—Psalms of David. Milton: At a Solemn Musick. Keats: The Eve of St. Agnes. Burn upward each to his point of bliss. Browning: The Statue and the Bust. ...incredibly aloof, flinging back the light in a dusky shimmer of bright hair and gilded outspread wings, soared the ranked angels, cherubim and seraphim, choir over choir, from corbel and hammer-beam floating face to face uplifted.—The Nine Tailors. Climbs to the mighty hail that Merlin built. Matthew and Mark and Luke and John. Camila Doyle (a poem read years ago, the title of which I have quite forgotten. This is itself “associated” with the children’s rhyme about Matthew, Mark, Luke and John). T. S. Eliot: The Waste Land. A bracelet of bright hair about the bone. It is, of course, open to anyone to point out that these great streams of power have been much diminished by pouring through my narrow channel. That is quite true, and is partly a measure of my lack of capacity and partly a recognition of the fact that any passage within a work demands a volume of power appropriate to its place in the unity of that work and no more. (Readers who are interested in studying how a great writer may incorporate and enhance the power of former writers, as well as of his own previous achievements, should study M. B. Ridley’s books Keats' Craftsmanship.) But what is important, and not always understood in these days, is that a reminiscent passage of this kind is intended to recall to the reader all the associated passages, and so put him in touch with the sources of power behind and beyond the writer. The demand for “originality”—with the implication that the reminiscence of other writers is a sin against originality and a defect in the work—is a recent one and would have seemed quite ludicrous to poets of the Augustan Age, or of Shakespeare’s time. The traditional view is that each new work should be a fresh focus of power through which former streams of beauty, emotion, and reflection are directed. This view is adopted, and perhaps carried to excess, by writers like T. S. Eliot, some of whose poems are a close web of quotations and adaptations, chosen for their associative value, or like James Joyce, who makes great use of the associative value of sounds and syllables. The criterion is, not whether the associations are called up, but whether the spirits invoked by this kind of verbal incantation are charged with personal power by the magician who speeds them about their new business. he did not mean to express the complicated emotion of impatience, relief, acceptance and forlorn hope which you experienced “at the last gasp of Love’s latest breath”. Nevertheless, he was a true prophet of your emotion, since he did express it, so that you feel the lines to have been written “for you”. In coming into contact with his Power, through the ink-and-paper body of his Energy, you are taken up into the eternal unity of Drayton’s Idea. You now lie within the orbit of the Power, which (immanent and transcendent) is also within you, and your response to it will bring forth further power, according to your own capacity and energy. If you react to it creatively, your response will again assume the form of: an Idea in your mind, the manifestation of that Idea in some form of Energy or Activity (speech, behaviour or what not), and a communication of Power to the world about you. This threefoldness in the reader’s mind corresponds to the threefoldness of the work (Book-as-Thought, Book-as-Written, Book-as-Read), and that again to the original threefoldness in the mind of the writer (Idea, Energy, Power). It is bound to be so, because that is the structure of the creative mind. When, therefore, we consider Trinitarian doctrine about the universal Creator, this is what we are driving at. We are arguing on the analogy of something perfectly familiar to our experience. The implication is that we find the threefold structure in ourselves (the-Book-as-Read) because that is the actual structure of the universe (the-Book-as-Written), and that it is in the universe because it is in God’s Idea about the universe (the-Book-as-Thought); further, that this structure is in God’s Idea because it is the structure of God’s mind. “Honourable Bird”, however, has certain advantages as a pictorial symbol, since, besides reminding us of those realities which it does symbolise, it also reminds us that the whole picture is a symbol and no more. There have been people so literal-minded as to suppose that God the Father really is an old man with a beard, but remarkably few adult persons can ever have believed that the Holy Ghost really was a dove. In what we may call the “standard” pictorial symbol of the Holy Trinity, the emphasis is rather upon the diversity than upon the identity; it depicts the Unity-in-Trinity. The Father, usually conceived as an aged priest, robed and crowned, holds upon His knees the figure of Christ crucified; between them hovers the Dove. The pictures of the First and the Third Persons are pure intellectual symbol— they represent nothing in time-space-matter; but the picture of the Second Person is living symbol: it represents an event in history. This is what our analogy would lead us to expect: it is only the Energy that issues in a material Book-as-Written; the Idea and the Power remain immaterial and timeless in their reflected natures as the Book-as-Thought and the Book-as-Read. A set of miniatures by Fouquet in the Book of Hours of Etienne Chevalier, presents us, on the other hand, with a very interesting pictorial symbol of the identity of the diversity, the Trinity-in-Unity: here, Father, Son and Holy Ghost are shown as all human, all young and all exactly alike. This is the Trinity in the mind—the essential identity of Idea, Energy and Power, which is reflected as a Trinity in the work—the Book being the same book, whether thought, written or read. Of these two pictorial symbols, the former operates to prevent the spectator from “confounding the Persons”, and the latter, to prevent him from “dividing the Substance”.